North-eastern Asia, which includes Eastern Siberia and the northern Pacific, is a predominantly mountainous region which extends from the river Lena to the Bering Strait and occupies about 1.5 million km2. In contrast to the Arctic coast, which was extensively researched between the 17th and the 19th centuries, the inner mountainous regions of the north-east remained very poorly known until recently. The first scientific expedition, funded by the Russian Academy of Science and led by Chersky, visited the region between 1891 and 1893. Perhaps the most important geographical discovery of the 20th century on land was made here: in 1926, an expedition led by Obruchev discovered a vast mountainous system which they named after Chersky. Not until the 1930s did detailed maps of the area become available. 1. The Verkhoyansk region includes the Verkhoyansk mountains and the Suntar-Khayata Ridge (Figure 13.7). Fig. 13.7 Sketch map of north-eastern Asia showing the location of the major orographic units and annual distribution of temperature and precipitation in several regions. In the Russian-language literature, the Verkhoyansk mountains are often referred to as a 'ridge' although the system includes a few dozens of ridges and its area exceeds that of the Caucasus. Perhaps this terminology reflects the fact that intermontane depressions are poorly developed and there are few tall summits. Altitudes increase southwards: in the north, the axial Kharualakh Ridge reaches 1400 m; further south, the main ridges (the Dzhardzhan, Orulgan, and Sietdin) reach 2000-2300 m. South of 64°N, ridges acquire a submeridional direction and landscapes become more strongly dissected. While the Sette-Daban attains 2000 m, the Skalisty and Suntar-Khayata Ridges located south-eastwards have distinct alpine landscapes and summits exceeding 2900 m.
2. The Chersky-Moma region includes the Chersky and Momsky mountains and the Poluosny Ridge. In contrast to the Verkhoyansk mountains, these are distinguished by strongly dissected relief and the separation of ridges by deep and narrow meridional and submeridional valleys. The largest Moma-Selenyakh valley divides the region into the smaller (100-120 km wide) north-eastern part and the larger south-western part formed by more than forty ridges with the summits reaching 3000 m.
3. The Yukagir-Anyuy region encompasses the basins of the Kolyma, Omolon, and Anyuy rivers including the Kolyma highlands. The highlands are an uplifted dome split by the Omolon into two segments: the Alazeya and Yukagir plateaux with the absolute heights of 500-1000 m.
4. The Northern Chukchi region extends eastwards of the Little Anyuy river and is a complex system of plateaux (including the Chukchi and the Rauchuan plateaux) and depressions. The ridges are about 800-1000 m high near the coast, reaching 1400-1800m inland. 5. The Koryak highland, formed by many ridges, are separated from the Northern Chukchi region by the Anadyr lowland and from the Yukagir-Anyuy region by the valley of the river Main. Average elevations are about 800-900 m, although many ridges attain 1100-1300 m and the tallest summit is Mount Ledyanaya (2562 m). Typical are large changes in elevation and steep slopes. Dissected terrain together with the unfavourable summer climate, characterized by strong winds and frequent snowstorms, makes this region difficult to access and it has been studied less than many other areas in north-eastern Asia. The north-east of Russia has long been presumed to be a continental collisional zone of very complex tectonics and geology (Fujita, 1978; Fujita and Newbury, 1982, 1983; Parfenov, 1984; Natapov and Stavsky, 1985; Zonenshain et al., 1990; Parfenov et al., 1993). It consists of a number of terrains most of which accreted to the Siberian platform (North Asian craton) in the Mesozoic and Cenozoic. The major units which occur between the Siberian platform and the Okhotsk-Chukotka volcanic belt are shown in Figure 13.6. The belt formed during the Cretaceous-Paleogene and separates the Mesozoic structures of the Verkhoyansk-Chukotka zone from the Cenozoic structures of the Koryak-Kamchatka zone. During the middle and late Devonian rifting events, which affected most of the Siberian platform, terrains (of which the Omolon and Kolyma massifs are the largest) were separated from the eastern margin of the platform and amalgamated in the early Jurassic, forming the Kolyma-Omolon superterrain. Similar to the eastern margin of the Siberian platform, the Koluma-Omolon superterrain controlled the orientation and intensity of folding and metamorphism. The subduction of the oceanic crust to the south-west of the massif in the Permian and Cretaceous forced the formation of the Chersky mountains as indicated by the occurrence of ophiolite fragments representing remnants of the back arc or oceanic crust located east of the Chersky mountains (Oxman et al., 1995). The collision with the North American Plate in the Cretaceous led to the formation of the Anyuy fold belt which contains remnants of the late Jurassic and more ancient oceanic basins. The re-accretion of the amalgamated Koluma-Omolon massif with Siberia in the late Jurassic-early Cretaceous gave rise to the Verkhoyansk mountains. This is separated from the massif by a fault zone formed of the Carboniferous-Jurassic littoral and marine deposits accumulated along the passive margin of the Siberian platform (Parfenov, 1984). Finally, the Koryak zone formed as a result of the amalgamation through accretion and collision of the Paleozoic terrains in the Cretaceous as indicated by the widespread presence of ophiolites (Stavsky et al., 1990; Sokolov, 1992; Filatova, 1995; Puchkov, 1996). Magmatism occurred widely across most of the Russian north-east in the Mesozoic. The lava extrusions can be found in the Kolyma highlands, in the Chukchi peninsula, and on the Sea of Okhotsk coast, and in the Yukagir plateau the ancient eroded relief is well-preserved under the lavas. At the later stages, after the basic structure of the region was formed, the extrusive magmatism was replaced by the formation of granite intrusions. Associated with intrusions, uncovered by erosion, are deposits of tin, lead, gold, tungsten, molybdenum, and other metals. After the orogeny of the Cretaceous, most of the area had a stable regime and underwent denudation until the neotectonic activity took place. One of the largest tectonic structures of the region, the Moma-Selennyakh rift system, which extends from the north-east of the Chersky mountains to north-eastern Kamchatka, was formed. The system is believed to be of Pliocene age or younger based on the absence of Paleogene deposits (Grachev, 1973). The occurrence of strong heat flow, bimodal volcanism and a thick layer of Cenozoic sediments have been used as indicators that the Moma-Selennyakh system is an active rift (Grachev, 1973; Savostin and Karasik, 1981; Fujita et al, 1990). However, the examination of focal mechanisms has shown that along the northern part of the rift system the present stress regime is com-pressional (Parfenov et al, 1988). The age of only one volcano within the Moma-Selennyakh system (the Balagan-Tas located in the valley of the river Moma) is certainly Quaternary, all other being of late Cretaceous-Tertiary age. The activity of another one was reported in the 1770s but extensive ground and air searches conducted in the 20th century have not corroborated this report (Fujita et al, 1990). The neotectonic activity raised the mountains but these vertical movements were strongly differentiated and coastal plains were flooded by the marine transgressions. The marginal ridges in the south and in the cast experienced the strongest upheavals. In the Moma-Selennyakh rift system, the peneplanated surfaces of the Pliocene age experienced an uplift of 1500-2000 m (Naimark, 1976). The contemporary uplift rate varies between 2 and 4 mm a-1. This is substantially lower than in the active parts of the Baikal rift which supports the argument that the Moma-Selennyakh rift system may no longer be active (Fujita et al., 1990). The uplift continuing throughout the Pleistocene and climatic cooling predetermined the development of glaciation in north-eastern Asia. There were three main glaciations subdivided into several phases (Arkhipov et al., 1986; Ananyev et al., 1993). In the mountains, the formation and expansion of glaciers may have occurred already in the early Pleistocene although there is little evidence that could be reliably attributed to this age. 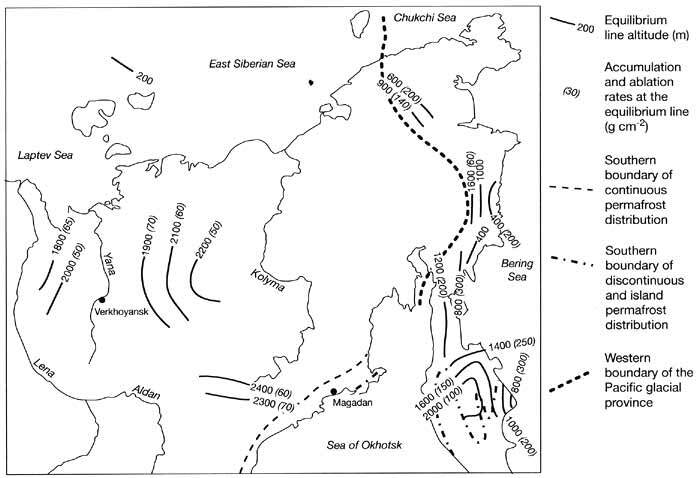 The early Pleistocene glaciers, which during some phases advanced to the coast, can be traced by the deposits of strongly leached tills preserved on the western coast of Kamchatka and, less certainly, the Chukchi peninsula (Bespalyy and Davidovich, 1974). There is much more evidence for the middle Pleistocene (Alginian) glaciation such as till, fluvioglacial, and glacial-lacustrine deposits in the mountains of the Kolyma basin and the Chukchi peninsula. This glaciation was predominantly of the mountain-valley type although it is possible that glaciers advanced on to the coastal lowlands in the eastern Chukchi peninsula and the Anadyr lowland (Arkhipov et al., 1986). The snow line lay at about 650-700 m in the maritime regions, rising up to 1300-1500 m inland. The late Pleistocene glaciation has been much better documented, although the lack of radiocarbon ages, many of which have been obtained for coastal and valley periglacial sites, makes the interpretation and correlation of glaciation in the mountains difficult. During the late Pleistocene, two glacial events alternated with interglacial conditions, being generally synchronous with climatic oscillations in other regions of Siberia (i.e., the Zyryanka and Sartan glaciations and the Kazantsevsky and Karginsky interglacials, see Table 2.1 and Figure 2.3). The evolution of the Siberian anticyclone predetemined the development of cold and arid conditions in the inland part of the region which limited the widespread accumulation of ice. At the time, not only Eastern Siberia but also the Pacific mountains were at a considerable distance from the sea because of the exposure of the Arctic shelf and the emergence of Beringia in the east. The paleoclimatic reconstructions based on palynolog-ical analysis have shown that mean annual temperatures were about -17°C with mean temperatures of the coldest and the warmest months being as low as -50°C and below +10°C. The annual precipitation totals did not exceed 150 mm and the winter monthly totals were below 10 mm (Ananyev et al., 1993). The extent of glaciation was controlled by two major factors: altitude and position of the mountains towards the moisture-bearing air flows. As elswhere in northern Asia, the earlier Zyryanka glaciation was more extensive, encompassing practically all the mountains higher than 1000 m and locally glaciers advanced on to the then exposed shelf (Bespalyy, 1984). The Sartan glaciation was manifested throughout the mountain areas and occupied about half of the area affected by the Zyryanka glacia-tion (Figure 13.8). 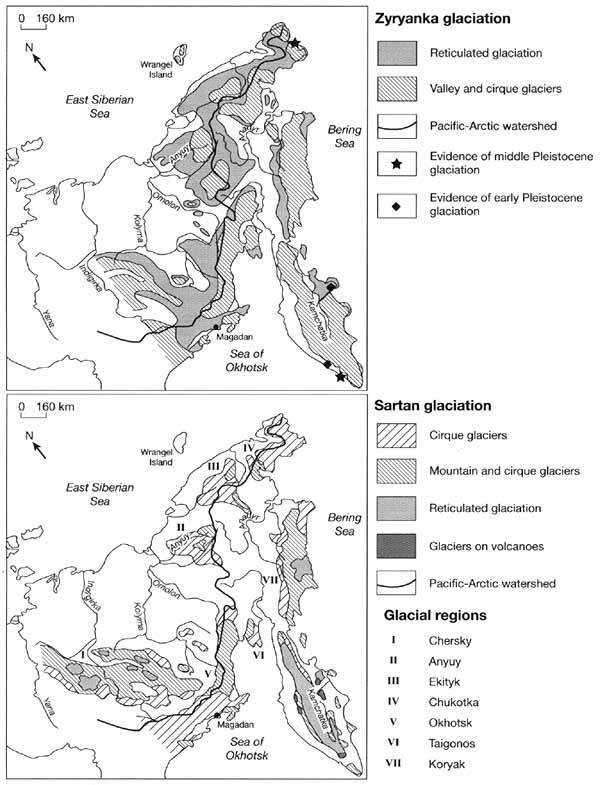 The formation and expansion of the Sartan ice occurred between 33 and 15 Ka BP, although the time of maximum glacial extent varied across the region and especially between the Verkhoyansk mountains and the Pacific glacial province. The ice spread from the most elevated parts of the mountains (e.g., the Verkhoyansk, Chersky, and the Koryak highlands), locally reaching into the foothills and descending on to the shelf. The cirque and valley glaciers predominated, with the extent of the valley glaciers usually under 20-25 km. According to the extent and prevailing morphological types of glaciers, a number of glacial regions are distinguished (Figure 13.8b). Altitude was the major control in the regions of the Arctic (Siberian) glacial province which received moisture with the westerly airflow. In the Pacific glacial province, to which moisture was delivered by the south-easterly winds, the humid climate predetermined the development of glaciers at lower altitudes and exposure was the main factor. A review of the nature and extent of glaciation during the glacial maximum between 20 and 18 Ka BP is provided by Ananyev et al. (1993) upon which the following text is largely based. The main centre of ice was the Verkhoyansk mountains. Most extensively glaciated was its western macro-slope where ice advanced into the foothills forming a piedmont glacier. 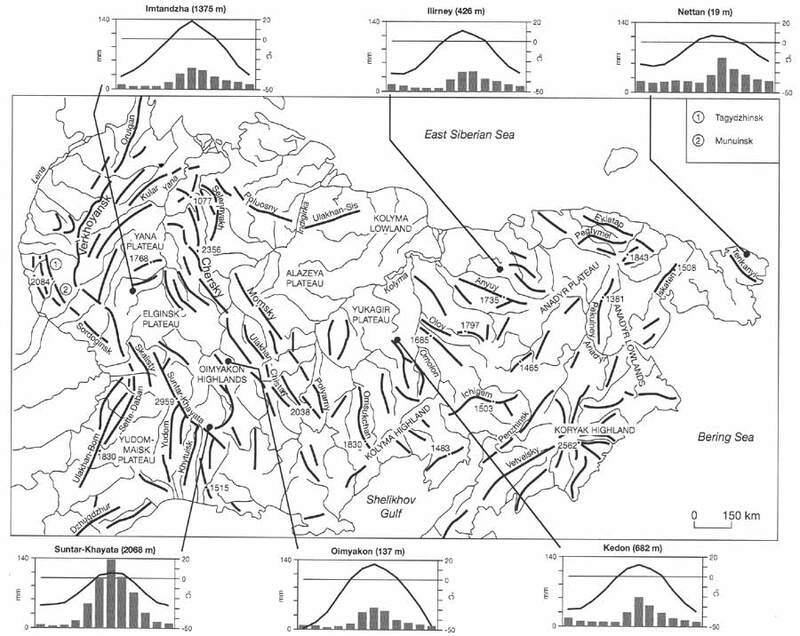 The terminal moraines form a continuous line along the western macroslope and extensive till occurs on the watersheds. In other parts of the mountains, glaciation was of the reticulated type while the highest central part of the mountains was apparently capped by ice. The ice may have been 150-200 m thick, locally reaching 500 m. In the Chersky glacial region, which included the highest points in the north-eastern Chersky mountains, glaciation developed mainly in the upper part of the mountains where it was of the reticulated type. Locally terminal moraines and outwash deposits occur in the intermontane depressions indicating that the ice spread to the lower levels too. In the lower south-eastern part of the Chersky mountains, smaller cirque and valley glaciers predominated. Dimensions of the valley glaciers varied according to the aspect between 5-7 km and 30-35 km in length and between 100 m and 500 m in thickness and depression of the snow line reached 600-800 m (Chanysheva and Bredikhin, 1981). Cirque glaciers were most typical of the north-east and north-facing slopes (reflecting the effect of shade and wind-drifted snow accumulation) where they often encroached on mountains forming pyramidal peaks or merged. Complex cirques with a number of terraces eroded in the cirque floor during glacial advances are typical of the Buordakh massif in the Suntar-Khayata. Similarly in the Momsky mountains, multiple glacial troughs enclosed into larger ones are typical. 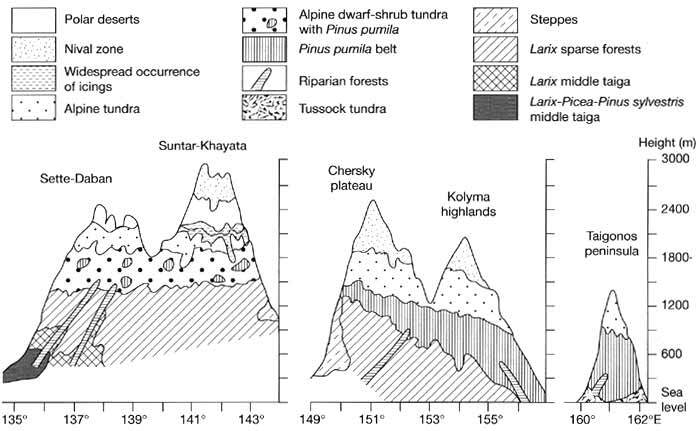 Glaciation in the Anyuy region, which encompassed the ridges of the Anyuy mountainous system, was similar to that in the south-eastern Chersky region but was less extensive and distinguished by the predominance of the cirque glaciers. The altitude of the cirque floors is lower than in the Chersky mountains, averaging 1000-1200 m, which indicates that depression of the snow line attained 500-700 m. The cirque and valley glaciers predominated in the Ekityk region which included the mountains of central Chukchi peninsula. Most intensively and widely glaciated was the southern slope of the Iskaten Ridge. The cirque floor altitude varies between 700 and 900 m and the occurrence of terminal moraines at a distance of 10-20 km down the valleys indicates that valley glaciation was widespread too. According to Goloudin (1981) and Ivanov (1983), glaciers descending from the Iskaten Ridge expanded on to the then exposed shelf. The submerged flat-topped hills, which occur in the northern part of the Gulf of the Cross, are interpreted as their terminal moraines. An asymmetrical distribution of the ice was typical of the meridional Pekulney Ridge: there are twice as many cirques on its western slope than on the eastern one. However, the largest valley glaciers developed on the eastern slope facing the Bering Sea where they reached 25-40 km in length. In the narrow valleys, the ice may have been 300-400 m thick while in the foothills its thickness apparently did not exceed 100-150 m. Depression of the snow line varied between 600 m and 800 m. The Chukotka region included the low and middle mountains of the eastern Chukchi peninsula where glacial activity was limited. The cirque glaciers dominated but they occupied a small area developing mainly from an elevation of 300-500 m. There were forty centres of alpine glaciation in the Okhotsk region, accommodating both cirque and valley glaciers, the largest of which developed in its southwestern part in the Suntar-Khayata mountains. The average cirque floor altitude declines from 1000-1300 m in the inner regions to 500-600 m near the coast. In the southern Suntar-Khayata, many cirques do not have a rock bar but form funnel-shaped basins which testifies to the high activity of glaciers (Ananyev, 1982). In the north-eastern Okhostsk region, where mountains occur close to the coast, glaciers dominated the sea-facing slopes. Cirques are plentiful and at present are often occupied by lakes. During the glacial maximum, the individual valley glaciers with a length of about 2 5 km merged, forming a complex glacial network. Terminal moraines and drumlins are typical of the intermontane depressions but they do not occur on the coastal plain which has led to suggestions that the ice may have extended on to the shelf. The Taigonos region included three separate centres of glaciation, the largest of which occurs in the Tainynot Ridge. Large cirques exceeding 1.5 km in diameter occur mainly from 800 m, although locally they were positioned as low as at 100 m. The cirque floor altitude indicates that the snow line gradually rose inland from 600 m to 900 m. The Koryak region, which encompasses the Koryak highlands, was glaciated more extensively than any other with the exception of the Verkhoyansk because of its large absolute heights (1600-2200 m) and proximity to the Pacific. The distribution of the ice was strongly asymmetrical. During the Sartan glacial maximum, a complex network of merging valley glaciers formed, covering almost the whole of the south-eastern macroslope and descending on to the then exposed shelf. Reticulated glaciation and small ice caps formed in the most elevated central part of the highlands and in the coastal ridges. In contrast, there was limited glacier development on the north-western macroslope where small cirque and valley glaciers predominated. The climatic amelioration at the start of the Holocene led to the retreat and waste of the ice. The first indications of climatic amelioration occur at about 12-12.5 Ka BP. 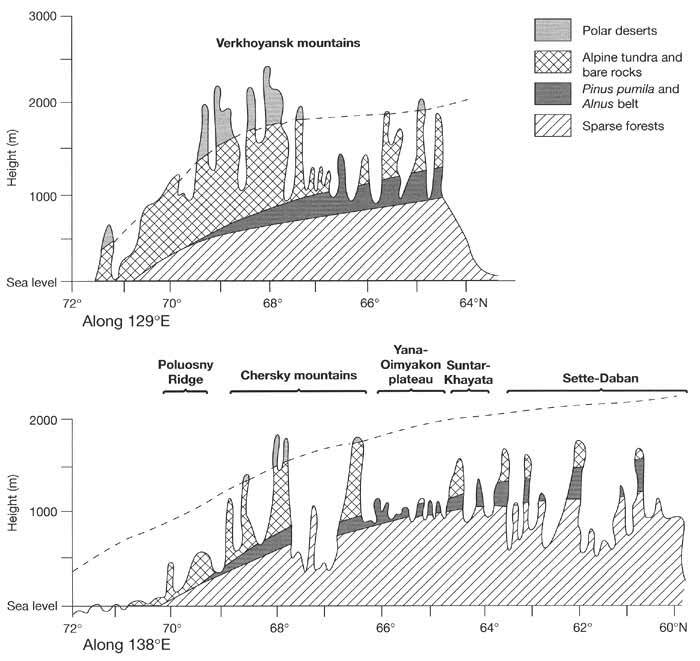 Changes in the biota during the late Pleistocene-Holocene transition about 11.7 Ka BP, which have been reconstructed for the upper Kolyma region (e.g., the occurrence of Salix about 100 km north of its present distribution limit), suggest that climatic amelioration was rapid and summer temperatures were higher than at present (Lozhkin etal, 1993). Due to the lack of climatic reconstructions for the mountainous environments of the north-east, the knowledge of regional climate change, which may not have been uniform during the early postglacial, is still fragmentary. Kaplina and Chekovsky (1987) suggest that between 9.5 and 8 Ka BP mean annual temperatures in the region were between -3°C and -6°C (i.e., considerably higher than now) as indicated by the expansion of Betula and Alnus to the shores of the East Siberian Sea. At the same time, Pinus pumila occupied larger areas in the mountains of the upper Kolyma basin, indicating that winter conditions were warmer and wetter. By contrast, the lowering of the tree line and the wide establishment of Pinus pumila-shrub tundra belt in the middle mountains in the Magadan region by 5 Ka BP points at the cooler summer temperatures (Lozhkin et al., 1993). Andreev et al. (1990) suggest that four warm intervals occurred in the Yana basin: about 6, 5.5, 4.6-4.7, and 4 Ka BP. Despite the imperfect knowledge of climatic change in the early Holocene, it can be suggested that by the time of the climatic optimum (7-5 Ka BP) the ice had probably completely disappeared. The modern glaciers, therefore, are not Pleistocene relicts but features developed under the favourable climatic and orographic conditions of modern times (Bespalyy, 1984). After the climatic optimum of the Holocene, conditions once again became cooler in many regions between 4.1 and 2.1 Ka BP and 1.5 Ka BP (Serebryanny and Solomina, 1996; Solomina, 1999). A return to more favourable conditions followed during the medieval warm epoch when the alpine tree line rose by 200-250 m compared to its present position. The woody vegetation of this phase was eventually destroyed by the advancing glaciers about 400-500 years ago (Lovelius, 1979; Earl et al., 1994; Vaganov et al., 1996; Serebryanny and Solomina, 1996; Solomina, 1999). Although temperature variability in north-eastern Asia was reduced in comparison with Western and Central Siberia, notably cold periods occurred between the late 16th and middle 17th centuries, late 18th and early 19th and late 19th and early 20th centuries. 1. Its position between 55°N and 73°N. The received solar radiation varies greatly between the north and south and the mountains encompass three climatic zones (arctic, subarctic, and temperate) which affects summer temperatures. 2. A zone of high pressure (an extension of the Siberian anticyclone), which dominates north-eastern Siberia between October and March, controls winter temperatures and seasonal precipitation patterns. 3. The Aleutian and the Okhotsk depressions force cyclogenesis over the Bering Sea and the Sea of Okhotsk, respectively, affecting the adjacent Chukchi peninsula and the Koryak region. 4. Orography: (a) insolation varies according to aspects; and (b) cold air masses from the Arctic Ocean penetrate lowlands and valleys exposed from the north and the stagnation and further radiative cooling of the arctic air promotes the development of extremely low winter temperatures. The most severe weather is associated with locally transformed air masses, while the advection of the fresh arctic air rises temperature by about 10°C. Temperature inversions are frequent and elevated regions often exhibit higher temperatures, particularly in the strongly dissected Chersky-Moma region. In the Oimyakon, Nera, and Elginsk plateaux the surface-based inversions develop to an altitude of 1200-1800 m. Precipitation increases with altitude and only high mountains benefit from moisture transported by the westerly air flow in winter. Ameliorating effects of the Bering Sea and the North Pacific are mostly limited to the narrow coastal zone because the coastal mountains prevent the advection of the maritime air landwards. Most of the region shows a wide annual range of temperatures. The cold period lasts for about seven to eight months and is especially severe in the inland intermontane depressions, such as the Oimyakon, where the lowest temperatures in the Northern Hemisphere are observed (Figures 3.5 and 13.7). In almost all the intermontane depressions located westwards of the river Omolon and away from the Arctic coast, mean January temperatures are below -40°C. Eastwards of the Omolon, the role of depressions developing over the northern Bering Sea increases and winter weather is milder. In the eastern Chukchi peninsula mean January temperatures are about -20°C. Depressions developing over the southern Bering Sea and the North Pacific occasionally reach into the continent and the Chukchi peninsula raising the air temperature to about -10°C (at a rate of 25-30°C a day) and promoting the development of fohn winds (Myachkova, 1983). In coastal regions, it is accompanied by strong storms and snowfalls and occasionally by thaws. By contrast, continental air masses bring about extremely cold and dry weather. While the influence of the Pacific ensures an even distribution of precipitation throughout the year in the eastern regions, the mountains of north-eastern Siberia receive little precipitation with a distinct winter minimum (Figures 3.10 and 13.7). Snow cover persists for 220-260 days, being relatively thin (about 30 cm) in the region of Verkhoyansk and increasing to 60-70 cm eastwards. In the Siberian climatic sector, the west-facing slopes receive more precipitation. For example, in the low Verkhoyansk mountains, annual precipitation totals are 350-500 mm on the western slopes and 150-250 mm on the eastern ones; the depth of snow varies between 40-60 cm and 15-30 cm respectively. With altitude the amount of precipitation increases, reaching 500-700 mm on the western slope of the Suntar-Khayata and the Chersky plateau at an altitude of about 2000 m. By contrast, in the Pacific region, eastern slopes receive more moisture: on the eastern slopes of the Okhotsk-Kolyma watershed and ridges of the Taigonos peninsula annual precipitation totals attain 600-700 mm at low elevations, reaching 800 mm on the eastern macroslope of the Koryak highland. The pluvial gradient is about 20-25 mm per 100 m altitude. The development of a relatively thick snow cover is limited by the tree or shrub line: above it snow is redistributed by wind and snow cover is irregular, being absent from the exposed sites and reaching 2-5 m in the protected sites, such as cirques, in which perennial snow packs develop. The density of snow cover varies from 0.1 to 0.2 g cm-3 in the continental regions to 0.4 to 0.5 g cm-3 (which is close to the density of firn) in the coastal mountains and in the valleys with a prevalent wind direction. In summer, mean temperatures vary between 10°C and 14°C in the landlocked regions and 6°C and 10°C in the coastal mountains, decreasing with height. Relatively low average temperatures are predetermined by frequent advection from the Arctic Ocean and the Bering Sea. Local transformation of air masses under the low pressure gradient conditions and the advection of warm continental air from central Sakha-Yakutia forces much higher temperatures, which can reach 30°C in the central and southern Verkhoyansk and Chersky mountains and 20°C in the mountains of the Chukchi peninsula at low elevations. The western part of the region receives about 70 per cent of its precipitation in summer; eastwards this proportion decreases to about 40 per cent. The modern distribution of glaciers is controlled by altitude and exposure. The combined glaciated area is about 1580 km2 (Yershov, 1989b). Glaciers mostly develop in the highest mountains such as the Suntar-Khayata and Chersky, which benefit from moisture transported by the westerly flow, and in the Koryak highland which, together with the mountains of Kamchatka, belong to the Pacific glacial province (Table 13.2). Various morphological types of glaciers occur, with valley glaciers dominating in the Suntar-Khayata and highly active cirque glaciers being most widespread in the Koryak highland. The altitude of the equilibrium line varies between 2400 m in the Suntar-Khayata to 600 m in the Pacific glacial province while snow patches and perennial snow packs develop at various altitudes (Figure 13.9). The absence of cover glaciation during the Pleistocene and the severity of the modern climate contribute to the widespread occurrence of permafrost (Yershov, 1989b), Most of the north-east is occupied by the continuous cryolithozone and only in a limited area on the Okhotsk coast does discontinuous permafrost occur. The mountainous regions located between the Lena and the Kolyma are distinguished by the lowest ground temperatures (between -4°C and -12°C) and the depth of permafrost which exceeds 600 m (Balobaev, 1983; Merzlotno-gidrologicheskie usloviya, 1984). As measurements of permafrost characteristics in northeastern Asia are limited, estimated parameters are mainly used. According to these estimations, in the northern Verkhoyansk mountains the depth of permafrost varies between 500 m and 1000 m on watersheds exceeding 500 m in altitude and between 500 m and 700 m on slopes at an altitude of 800-1000 m (Feldman et al., 1988). In the southern Verkhoyansk mountains and in the Suntar-Khayata, the depth of permafrost attains 300-500 m between an altitude of 1000-2500 m and 700-900 m above 2500 m in non-glaciated areas. The depth of the active layer varies strongly as a function of altitude, aspect, microclimatic, and hydrological conditions, and vegetation. In the Verkhoyansk mountains, thawing occurs between June and early September at a rate of 0.8-2.6 cm day-1 (Vasilyev, 1982). The maximum depth of the active layer (about 1.5 m) is observed in the low and middle mountains on the southern slopes with poor vegetation cover, while in peatlands the active layer is no more than 0.5 m deep (see above for an explanation). In the mountains located within the Okhotsk-Chukotka volcanic belt, the temperature of the permafrost rises while its depth decreases due to milder winter conditions and the widespread occurrence of thermal ground water. Thus, in the upper course of the Kolyma, the permafrost temperatures range between -1°C and -5°C and in the valleys of its eastern tributaries, measurements have revealed an anomalously low thickness of frozen ground which does not exceed 65 m and which locally may be as small as 15-20 m (Strelkov, 1965). Permafrost favours abundant runoff despite the meagre precipitation received by most of the low and middle mountains in the Siberian sector. However, river discharge has strong seasonal variations: in winter many rivers freeze through and runoff ceases (Figure 5.6). As in the Putorana, icings are widespread. They form on streams and rivers and in many areas their formation is enhanced by the seepage of thermal ground water. This occurs along the tectonic fissures which are in turn widened by the ice. In the Verkhoyansk region, icings occupy in total over 1800 km2, concentrating mainly in the Orulgan Ridge and in the middle Suntar-Khayata mountains (Figure 13.10), but they are mainly small (1-2 km2). By contrast, in the Chersky-Moma region, where the most extensive across the FSU formation of icings takes place, individual icings occupy large areas and do not melt in summer. Thus the largest one, developing in the Moma valley, occupies about 80 km2 and contains over 200 million m3 water (Tolstikhin, 1974). The largest icings occur in valleys where carbonate rocks are broken by faults and fissures. In the middle and high mountains, icings develop in glacial troughs where areas of water-permeable till alternate with crystalline rocks. These are particularly widespread in the regions of the Pleistocene and modern glaciations such as the Buordakh massif and the Ulukhan-Chistay Ridge. Often areas covered by the icing deposits substantially exceed areas covered by ice which is particularly typical of the Chersky plateau. These deposits are believed to have survived since the Pleistocene. Another hypothesis attributes their formation to the modern seismic activity which causes river and ground water reservoir captures followed by the dislocation of icings (Rozenbaum et al., 1991a). The northern Chukchi peninsula is another area of widespread occurrence of large icings which owe their existence to the thermal ground waters emerging along tectonic faults and fissures from a depth of 2-3 km (Tolstikhin, 1974). The whole spectrum of cryogenic and slope processes typical of cold climates, such as frost weathering, sorting, wedging, and solifluction which play an important role in the formation of landscapes particularly in the upper mountains, is represented in north-eastern Asia. The extent and intensity of these processes are controlled by various factors including the type of rocks, presence and thickness of unconsolidated deposits, and steepness of slopes. Thus, fine material, favouring the development of solifluction, is produced by the weathering of argillite, aleurite, schists, and acid volcano-terragenic rocks. Coarse material, moved in block streams and screes, is formed of sandstone, granite, cornubianite, and basic volcano-terragenic rocks. Ice-wedge formation is ubiquitous in the Chersky-Moma region and the northern Verkhoyansk mountains while in the southern Verkhoyansk their occurrence is mostly limited to the northern macroslope of the Suntar-Khayata. The largest ice wedges, which exceed 3 m in surface diameter and 5-8 m in depth, develop in the Verkhoyansk region in wide valleys and where mountains merge with plateaux. In the southern Verkhoyansk mountains, northern Chukchi peninsula, and the Koryak highland thawing of ice wedges has led to the widespread development of thermokarst. Thus, in the Koryak highland the maximum surface subsidence reaches 10-12 m and in the Main basin thermokarst destroys a layer of ground up to 6-8 m thick per year (Yershov, 1989b). This phenomenon seldom occurs naturally in the northern Verkhoyansk and Chersky mountains where it is mainly limited to the moraines of modern glaciers that have a high ground ice content. These often dam surface runoff which leads to the development of thermal abrasion and erosion at a rate of a dozen metres per decade. These processes intensify the deposition of alluvium downstream and redistribute runoff, decreasing the proportion of surface and increasing the proportion of below ground drainage which in turn has a strong effect on the formation of icings (Nekrasov et al., 1973). Traces of relict thermokarst and thermal erosion are typical of the Pleistocene moraines across the north-east. Although solifluction develops across the region, it is most extensive in the Yukagir plateau and the Anyuy mountains where it affects between 40 per cent and 90 per cent of the slope territory (Rozenbaum et al., 1991b). The abundant glacial, fluvioglacial, lacustrine, and alluvial deposits, ubiquitous permafrost, the prevailing slope angles of 5-15°, and sparse vegetation predetermine its widespread occurrence. Solifluction terraces, with treads reaching 5 m in width and 1.5 m in depth, tongue-shaped lobes and ramparts about 0.5 m high are a distinct feature of the landscape. On the steeper (15-25°) slopes, these forms have larger dimensions: terraces have a width of 50-100 m and a height of 1.5-3 m and the ramparts are about 3 m high. Both smaller and larger solifluction landforms are composed of sediments with a high concentration of ice and thermokarst, which otherwise affects about 10 per cent of the Yukagir and Anyuy territory, is widespread. Larger forms often dam small valleys, altering drainage patterns. The vegetation of the north-eastern mountains is dominated by three floras: Okhotian, East Siberian (Yakutian), and Beringian. Despite the severe climate and widespread occurrence of permafrost, a large proportion of the mountains of north-eastern Asia is dominated by woody communities: sparse forests composed of Larix gmelinii and thickets of Pinus pumila while Pirns sylvestris and Picea obovata occur only in the southern Verkhoyansk mountains (Parmuzin, 1979a; Tyrtikov, 1995). Forests develop on the weakly podzolic soils which are shallow and rocky, contain little humic matter but plenty of moisture and peat. Latitudinal and altitudinal distributions of Larix gmelinii and Pinus pumila are limited by the mean July and January isotherms of +12°C and -34°C and the mean annual isohyets of 150-200 mm (Andreev, 1980). Summer temperature is the main control over the growth of Larix gmelinii while snow cover is an important factor limiting the distribution of Pinus pumila which, being evergreen, requires protection from the severe winter cold. Other woody plants, such as Betula exilis, B. middendorfii, Salix spp., and Alnus fruticosa, form the undergrowth in sparse forests while the shrub tier consists of species belonging to the Ericaceae family. Sparse larch forests occur mainly on the south-facing slopes, reaching an altitude of about 1200 m in the Sette-Daban and the Suntar-Khayata (Figures 13.10 and 13.11), while forest-tundra communities dominate at the same altitudes on north-facing slopes. The density of the forest canopy declines eastwards and beyond the basins of the Kolyma and the Little Anyuy the mountains are treeless with the exception of the valley of the river Main, and the mountains in the upper Anadyr and the middle Penzhina courses. The development of closed forests is restricted to protected habitats, such as river valleys, where the yearly flooding of light alluvial soil and well-drained gravel subsoil create a deeper active layer and thicker snow cover provides better wintering conditions. The riparian forests are dominated by Populus suaveolens and a relict species, Chosenia macrolepis. A characteristic feature of the altitudinal sequences is the occurrence of the steppe communities and mires in valleys and lower mountains. The steppe and locally forest-steppe communities, dominated by Carex, Poa, Festuca, Avenastrum, Agropyron, Veronica, and Potentilla spp., usually develop on the south-facing slopes to an altitude of 500-700 m in the mountains of the Yana, Indigirka, and Kolyma basins (Yurtsev, 1974a, b; Isachenko, 1985). Shallow rocky soils, closely resembling chestnut soils, develop under the steppe communities. The steppes of north-eastern Asia are a continuation of the steppes of Sakha-Yakutia and Southern Siberia. They contain many Mongolian and Dahurian species although they are less species-rich than the steppes developing westwards and southwards. 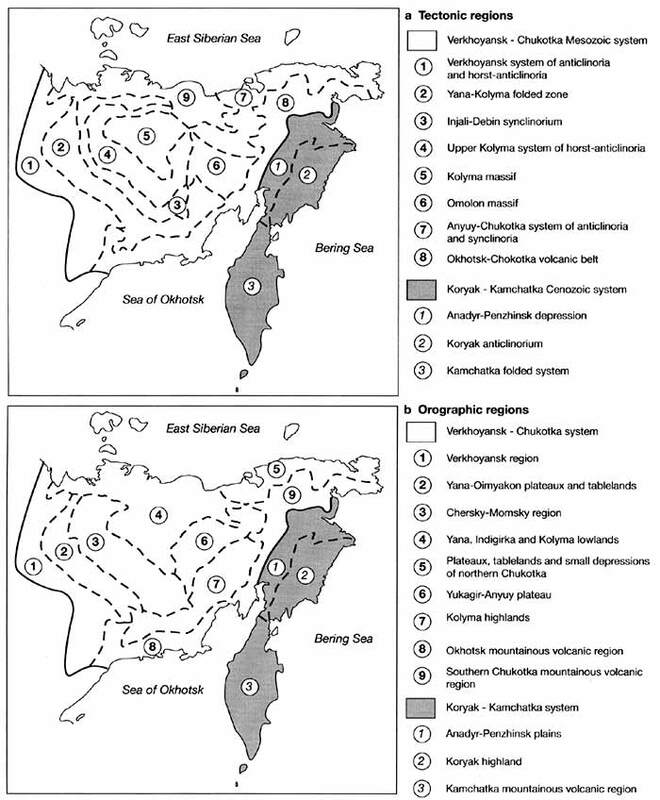 Whereas these communities are Pleistocene relicts, the modern arid climate with severe winters and hot summers favours the growth of xerophilous species (Yurtsev, 1974a, b). Human activities also enhance the spread of the steppe vegetation. In the basins of the Yana and Indigirka, the steppe species colonize forest clearings within a year, while grazing makes the presence of these species more permanent (Agakhany ants, 1986). Above the larch limits, Pinus pumila predominates. The upper parts of the slopes are free of woody vegetation. They are dominated by tundra landscapes which are succeeded by polar deserts almost devoid of vegetation (Figures 13.10 and 13.11). The Arctic, and the Pacific coasts have received more attention both from the former Soviet research organizations and from international programmes in particular with respect to permafrost, cryogenic, and geomorphological processes and paleoclimatic interpretation of landforms and deposits. Other areas (e.g., the south-eastern Chersky mountains, the Koryak highland) remain among the world's most little known. There is a great need for detailed investigation of the physical geography of this enormous and often hostile area to establish its environmental history on both regional and local levels and to evaluate the response of its environments to climatic change on various time scales. This presents a great challenge for geographers in the 21st century.